Previous studies have shown that memory is adapted to remember information when it is processed in a survival context. This study investigates how procedural changes in Marinho (2012) study might have led to her failure to replicate the survival mnemonic advantage. In two between-subjects design experiments, participants were instructed to learn words from ad hoc categories and to rate their relevance to a survival or a control scenario. No survival advantage was obtained in either experiment. The Adjusted Ratio of Clustering (ARC) scores revealed that including the category labels made the participants rely more on the category structure of the list. Various procedural aspects of the conducted experiments are discussed as possible reasons underlying the absence of the survival effect. The functional-evolutionary approach suggests that memory systems have evolved in a way that allows people to remember fitness-relevant information – that is, information that would increase the chances of one’s survival and/or reproduction (Nairne & Pandeirada, 2008b; Nairne, Thompson, & Pandeirada, 2007). Tasks such as finding nourishment, protecting ourselves from predators, or securing a mate would be examples of fitness-relevant tasks (Nairne & Pandeirada, 2008b). Nairne et al. (2007) introduced a new paradigm to empirically test this idea: the survival processing paradigm. This paradigm follows the logic of the traditional levels-of-processing approach (Craik & Lockhart, 1972) where memory for information is tested after being submitted to different encoding tasks that induce different levels of processing. For example, answering the question “Is the letter ‘a’ present in the word?” induces a shallow level of processing, whereas answering the question “How pleasant is the word?” induces a deep level of processing. The latter is considered to involve a deep level of processing because it requires the consideration of the meaning of the word, while the former does not. According to this perspective, the deeper or more elaborate the processing is, the higher the likelihood the item will be recalled. Nairne et al. (2007) revealed that fitness-relevant processing substantially enhances retention relative to traditional deep processing tasks, as described next. In their research, Nairne et al., compared the effect of deep processing versus fitness-relevant processing on recall. During the encoding task, participants were asked to rate unrelated words in terms of their relevance to a survival scenario, a moving to a foreign land scenario, or for their pleasantness. After a distractor task, an unexpected free recall task was performed; in this task participants were asked to remember the words previously rated, in any order they wished. The set of experiments reported in this work revealed an advantage of survival processing when compared to all other deep processing control conditions using both free recall and recognition tests. Since the original study, many studies have replicated the mnemonic advantage afforded by survival processing manipulating different variables and using a variety of different procedures. The survival condition has now been compared with a large set of other incidental learning tasks (e.g. Nairne, Pandeirada, & Thompson, 2008; Weinstein, Bugg, & Roediger, 2008), as well as against an intentional learning condition (Nairne et al., 2008). The survival advantage has also proven to be strong in free recall and recognition tests (Kang, McDermott, & Cohen, 2008; Nairne & Pandeirada, 2008a; Nairne et al., 2008, 2007), although it is less pronounced in tests of implicit memory, such as stem-cued recall, concreteness judgments, and explicit cued recall tasks (Tse & Altarriba, 2010). The effect has also been shown to generalise to different procedural designs (Nairne et al., 2008, 2007) and diverse age groups (e.g. Aslan & Bäuml, 2012; Nairne et al., 2007; Pandeirada, Pinho, & Faria, 2014; Pandeirada, Pires, & Soares, in press). Of relevance to this study, the survival mnemonic advantage has also been obtained with related and unrelated verbal material (Nairne & Pandeirada, 2008a), as well as with pictures (Otgaar, Smeets, & Bergen, 2010). Together, these results suggest the survival paradigm to be fairly robust. However, no consensus yet exists amongst scholars on the mechanisms that underlie the survival mnemonic advantage. Recently, Marinho’s (2012) work has combined the survival processing paradigm and the Retrieval Induced Forgetting (RIF) paradigm. Her goal was to investigate if processing the information for survival would affect the RIF usually obtained in this paradigm. The RIF paradigm typically involves the following phases: 1. Study phase, where participants are asked to memorize a list of words for a future test (intentional learning); 2. Retrieval practice, where participants recall half of the items from half of the presented categories via a cued-recall task (i.e. category name + initial letters of the target word); 3. Distractor task; and 4. Final memory test, where memory for all the items is tested via the same cued-recall task (Anderson, Bjork, & Bjork, 1994). This RIF procedure creates three types of items: namely, practiced items from the practiced categories (RP+), items from the practiced categories that were not practiced during the retrieval-practice phase (RP-), and, items from the categories that were never practiced (NRP). Two effects are usually obtained from this paradigm: a facilitation effect and RIF (Anderson et al., 1994; Marinho, 2012). The first refers to better memory performance for the practiced items as compared to the non-practiced items from the non-practiced categories (i.e. RP+ > NRP). RIF refers to a lower recall of items from the practiced categories that were not practiced during the retrieval-practice phase, as compared to the items from the categories that were never practiced (i.e. RP- < NRP). In Marinho’s study, the semantic categories typically used in the RIF paradigm were replaced with ad hoc categories, that is, lists of unrelated words that can be grouped together according to a common theme (e.g. “things dogs chase”; Barsalou, 1983). As mentioned above, Marinho combined the two paradigms (RIF and survival) and while her main goal focused on RIF, she expected to replicate the typical survival advantage in the final cued-recall task. In a between-subjects procedure, a group of participants rated the to-be-learned words in terms of their relevance to a survival scenario, and the control group rated them for a moving scenario. This rating task occurred after an initial learning period of 6 sec, participants were instructed to relate the item to its respective category in order to learn it. The results replicated the usual facilitation effect (i.e. RP+ > NRP) for both conditions, but did not replicate the RIF effect (i.e., NRP ≈ RP- in both conditions), or the survival advantage (i.e. performance for the RP+, RP-, and NRP items were similar for both conditions). This final result is intriguing and may be explained in terms of a number of features of the experimental paradigm she used. One of the changes in the procedure of Marinho (2012) as compared to the typical survival procedure, was the intentional nature of the task. In survival processing an incidental form is typically used. Also, ad hoc categories were used as the test material. Providing an organisational structure to the items via the presentation of their respective category label could have induced a form of relational processing that consequently could have lessened the influence of the scenario encoding task. Another important difference in this procedure is the inclusion of a retrieval-practice phase focused on the categorical organisation of the items given that one of the retrieval cues was the category label. Finally, she used a cued-recall test, which did not produce the survival advantage in a previous study (Tse & Altarriba, 2010). The latter two factors seemed the best candidates to explain the absence of the effect in Marinho’s study – the first, because it introduces the strongest deviation to the typical survival paradigm, and the second, because it has failed to generate the effect in previous work (Tse & Altarriba, 2010). During the retrieval-practice phase, the association between the items and their corresponding category is strongly reinforced. This could significantly overshadow the survival and moving to a foreign land encoding tasks, thus diminishing their effect in the final memory task. The intentional learning nature of the task should not eliminate the effect if it is being driven by the fitness-relevancy of the survival encoding task. It also seems unlikely that the usage of different sets of words would prevent the effect from occurring given the numerous replications of the effect using different lists of items (e.g. Nairne & Pandeirada, 2011; Weinstein et al., 2008). However, the presence of the category labels could have induced a form of relational processing that would attenuate the encoding relative to the survival/control scenario. The present study focuses on trying to explore why Marinho (2012) failed to obtain the survival effect; to this end, we replicated the procedure of her second experiment but changed the elements believed to be the strongest factors preventing the survival effect from occurring in her experiment. Specifically, we eliminated the retrieval practice task, therefore, a RIF design was no longer used; and replaced the cued-recall task with a free recall task, a task that has replicated the effect in a number of previous investigations (Nairne & Pandeirada, 2008a; Nairne et al., 2008, 2007; Weinstein, Bugg, & Roediger, 2008). We believe these changes will promote the survival advantage, as the procedure now resembles more the traditional procedure of the survival paradigm (Nairne et al., 2007). Thus, we hypothesised that the survival effect would be observed when the retrieval practice and the cued-recall tasks were eliminated from the original study of Marinho. Another motivation for our study is to contribute to the debate on the proximate mechanisms that might underlie the survival advantage. In a recent paper, Burns, Burns and Hwang (2011) demonstrated that the survival processing advantage might be explained by the combination of both item-specific (encoding of the individual characteristics of items) and relational (establish relationships among list items) processing, while the control conditions use only one of these forms of processing. They also reported that when the control tasks encouraged the use of both types of processing the survival advantage was not observed. In a more recent paper, the same group of authors suggested that a special form of item-specific processing afforded the survival advantage (Burns, Hart, Griffith, & Burns, 2013). Nairne and Pandeirada (2008a) compared survival processing with a pleasantness-rating control condition, using semantic categories. In their experiments, the survival mnemonic advantage was found, although the control condition also induced both item-specific and relational processing. These contradicting results warrant further investigation to help clarify the role these two forms of processing might play in the survival processing advantage. The current experiment used ad hoc categories presented with the corresponding category labels, thus a form of relational processing is activated by the nature of the material. If the survival and moving scenarios both induce some form of item-specific processing we will not expect to obtain the survival advantage. Thus, we will explore the contribution of item-specific and of relational processing to the survival mnemonic advantage using several dependent measures, such as: the cumulative-recall curves and the Adjusted Ratio of Clustering (ARC). In this first experiment, participants were instructed to learn the words by relating them to their respective category, and then they received the prompt to rate the words for the survival or the moving (control) scenario. This encoding procedure is the same as in Marinho’s (2012) second experiment, but the retrieval-practice phase that followed the initial learning phase in her study was eliminated here. A distractor task was then performed and followed by the free recall task (instead of a category-cued recall test used by Marinho). This experiment aimed to test whether the absence of the survival effect in her work could be due to the retrieval practice task and the nature of the final task. Using this procedure a survival advantage is hypothesised. Participants and apparatus. Sixty-two students from the University of Aveiro (33 women), aged between 18 and 28 years old (M = 20.5; SD = 3.5) participated voluntarily; some of the students gained partial credit in a psychology course. The experiment was run in groups with a maximum number of nine participants in a spacious and illuminated laboratory. They were tested using individual computers in sessions lasting approximately 30 minutes. Stimuli were presented and controlled by the E-Prime program (Schneider, Eschman, & Zuccolotto, 2002). Material. Stimulus material consisted of the six exemplars from eight ad hoc categories used by Marinho (2012): things women wear, things people put on walls, things that make noise, things that are mainly made of plastic, things that people keep in their pockets, things that smell, inflammable things, and things that dogs chase. The detailed list of words from each ad hoc category is presented in the Appendix. The first six categories listed (with six items in each category) were the experimental categories and the final two were used as buffer categories. These last two categories were used to reduce the list-related serial position effects and their results were not included in the analyses of the data. Procedure and design. On arrival to the laboratory participants were randomly assigned to one of the two conditions (N = 30 in survival scenario and N = 32 in the moving scenario; between-subjects design). They had three different tasks to fulfill: an encoding task, a distractor task and a memory task. Survival. In this task, we would like you to imagine that you are lost in the grasslands of a foreign land without any basic survival materials. Over the next few months, you’ll need to find steady supplies of food and water, and protect yourself from predators. Moving. In this task, we would like you to imagine that you are planning to move to a new home in a foreign land. Over the next few months, you’ll need to locate and purchase a new home and transport your belongings. Then, the encoding task was presented and included two steps: intentional learning and scenario rating. In the intentional learning screen each word was presented along with the respective category label for 6 sec; the category label was presented above the item, both centered on the screen. After a 1 sec stimulus interval, the scenario-rating phase followed. Here, the same word was presented in the center of the screen along with the rating question “How relevant is this word to survival/moving to a new home?” (presented above the word), and the rating scale (presented below the word). Participants were asked to rate the words on a 5-point scale, with 1 indicating “totally irrelevant” and 5 signifying “extremely relevant”, by clicking on the number that corresponded to his or her choice. They were advised to make their decisions quickly, given the 4 sec presentation rate, and to try to use the entire scale (i.e., all the values from 1 to 5). Overall, the encoding phase of each item lasted 10 sec. Secondly, the distractor task was conducted to minimize any serial position effects in the final recall task. During this task, participants were asked to classify whether the digit presented in the middle of the screen was an even or an odd number. The answer was provided by pressing the key ‘P’ when the digit was even and ‘I’ when it was odd. The distractor task lasted 5 min. Finally, the free recall memory task was given to the participants. They were asked to write down the words they had learned and rated earlier in the encoding task, in any order, on a response sheet provided by the experimenter. As every minute passed, participants were also asked to draw a line below the last written word, to permit the further analysis of cumulative-recall scores by minute. To indicate when to draw the line, a sequence of two red colored screens flashed, letting them know a minute had passed. This final recall phase lasted 5 min. The following dependent variables were deemed relevant to our study: scenario ratings, encoding response times and final overall recall. The first two variables are of interest as significant differences between the two conditions on these variables could affect the final recall. For example, if words were considered more relevant to one of the scenarios, that could indicate a stronger congruency between the material and the encoding task increasing the recall for that condition (see Butler, Kang, & Roediger, 2009; Nairne & Pandeirada, 2011). At the same time, longer response times could indicate a greater effort to perform the task, which could also affect recall (Nairne et al., 2007). No significant differences between the two conditions on these variables were anticipated. Final free recall is the dependent variable of greatest interest as it reveals whether the survival advantage was obtained in our study; we hypothesised that participants would recall more words in the survival condition than in the moving to a foreign land condition. Additionally, we analysed two variables that indicate the extent of item-specific and relational processing occurring in both conditions and how these might have influenced the recall performance in the two conditions. The first variable is the cumulative-recall curve along with its characterisation; using the rate of approaching asymptote and the asymptotic level (as per Burns et al, 2011). The second variable is the ARC score (Roenker, Thompson, & Brown, 1971). Based on recent work (Burns et al., 2013), we expected to find that survival processing induced more item-specific processing than moving processing. This would be reflected in a less steeped cumulative recall curve but a higher asymptote, as well as lower ARC scores, for survival as compared to the moving to a foreign land condition. The significance level for all of the statistical comparisons was set at p < .05. By default all analysis were first conducted using the subject as the unit of analysis. Additionally, we also performed the analysis on the main dependent variables considering the item as the unit of analysis and briefly report these results. Ratings. The mean ratings for each condition are shown in Table 1. The t-test for independent samples revealed a significant difference between conditions (t(60) = 7.13, p < .001, and t(35) = 4.54, p < .001, for the participant and item analysis, respectively), indicating that participants rated the items presented during the encoding phase as more relevant to the moving to a foreign land scenario than to the survival scenario. According to a congruity argument, this difference in rating could lead to more words being recalled for moving, as compared to survival, as these were deemed as more relevant than in the survival condition. However, the correlation between proportion of recall and rating for each condition revealed only weak positive correlations between proportion recall and rating in the moving to a foreign land (r = 0.14, p = .46), as well as in the survival (r = 0.06, p = .76) condition. These results indicate that the rating difference between conditions probably did not influence the observed recall pattern. Note: ARC = Adjusted Ratio of Clustering. The rating scale of relevance varied from 1 (irrelevant) to 5 (very relevant). Response times. The rating response times in the moving and survival conditions (see Table 1) indicate that participants were faster at rating the words in the moving condition than in the survival condition. The t-test for independent samples showed this difference was not significant, t(60) = -1.78, p = .08. However, the item analysis revealed participants took significantly longer to rate the words for the survival scenario than for the moving to a foreign land scenario, t(35) = -5.17, p < .001. Overall recall scores. The mean percentage of items correctly recalled in each condition is shown in Table 1. A t-test for independent samples revealed no significant difference between conditions, t(50.13) = -.022, p = .98, for the subject analysis; and t(35) = 1.13, p = .27, for the item analysis. Cumulative-recall curves. The cumulative-recall analysis indicates whether there were any significant differences in the number of recalled items per minute between conditions. The data from two participants in the moving to a foreign land condition were eliminated from the statistical analysis of this variable because they did not draw a line after each minute passed (N = 28). The cumulative-recall curves produced by the two conditions are displayed in Figure 1, which shows that the survival and moving groups produced nearly identical recall curves. A mixed ANOVA, with minute (1, 2, 3, 4, and 5) as a within-subject variable and condition (survival or moving) as a between-subjects variable, revealed a significant main effect of time, F(1.75, 101.75) = 218.7, p < .001, ηp2 = .79. However, neither the main effect of condition (moving vs. survival), F(1, 58) = .01, p = .94, ηp2 < .001, nor the interaction between minute and condition, F(1.75, 101.75) = 1.41, p = .23, ηp2 = .02, were significant. 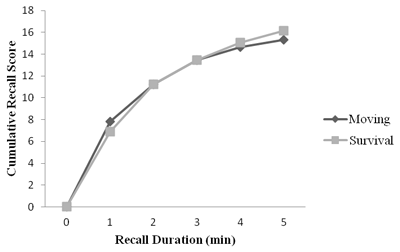 Pairwise comparisons on the number of recalled items per minute showed that during the first two minutes participants recalled significantly more items in both groups (p < .001) as compared to the remaining period of recall. During the last three minutes, on average, very few additional items were recalled (1.9 in the survival condition, and 1.5 in the moving condition), but this difference was not significant (lower p = .32). Mean cumulative-recall for each condition in Experiment 1. In order to understand if different amounts of item-specific or relational processing were produced in each condition we used the exponential equation of Burns et al. (2011) to estimate the rate of approaching asymptote and the asymptotic level of recall. A higher level of relational processing produces curves with a steep slope that reach asymptotic levels very quickly, whereas the curves resulting from item-specific processing produce a more gradual slope. Conditions performing both types of processing produce initially high recall as well as a relatively gradual approach to asymptote (Burns et al., 2011). The data regarding the rate of approach to asymptote, which reveal the amount of relational processing (Table 1), suggest that survival processing induced less relational processing than moving processing as it produced the lower estimate values. However, the univariate ANOVA did not reveal a significant difference between conditions, F(1, 58) = 2.51, p = .12, ηp2 = .04. Concerning the estimates of asymptotic level of recall, which reveal the amount of item-specific processing, the data reversed: the survival group obtained higher estimated values in comparison to the moving group. Nevertheless, the univariate ANOVA revealed, again, no significant difference between conditions, F(1, 58) = 2.31, p = .13, ηp2 = .04. Clustering scores. Given that we provided the category labels to participants during encoding, we can determine the extent to which their recall was organised or clustered according to this categorisation. To this end, we calculated the adjusted ratio of clustering (ARC) score (Roenker et al., 1971) for each participant, which indicates the extent to which they relied on this categorical structure of the information to guide their recall of the information (e.g. Hunt & Seta, 1984); “An ARC score of +1.00 indicates perfect clustering, and a score of 0.00 indicates chance-level clustering” (Burns et al., 2011, p. 211). The mean ARC scores obtained (see Table 1 for the descriptive statistics) revealed that the two groups produced a moderate degree of clustering, suggesting that both groups used the categorical organisation of the information to help them recall the items (also considered a form of relational processing). The non-parametric Mann-Whitney test for independent samples confirmed no reliable difference between conditions (M = .57, for moving; and M = .61 for survival; U = 463.5, z = -.23, p = .82). As mentioned previously, this clustering measure indicates the extent to which the categorised nature of the list was used as a recall strategy. In order to clarify the influence of adopting a recall strategy based on the categorisation of the information in the current experiment, we performed a median split in each condition based on the ARC scores, thus obtaining a group of high ARC scorers (N = 16, for moving; N = 15, for survival) and a group of low ARC scorers (N = 16, for moving; N = 15, for survival) (see Table 2). We were particularly interested in the recall performance of the participants with the low ARC scores, as these did not rely as strongly on the category structure to recall the information and, thus, had a higher probability of using the scenario-rating task as a main recall strategy. The separate analysis of the ARC scores produced by the low ARC scores group did not show any significant difference between conditions (U = 116, z = -.16, p = .89). Note: ARC = Adjusted Ratio of Clustering. As for the recall performance for this subset of participants, although a numeric advantage was obtained for moving as compared to the survival condition, the independent sample t-test revealed a non-significant difference between conditions, t(29) = .93, p = .36. Therefore, even for the participants who seemed not to rely as heavily on the categorical organisation of the list and, thus, could have been more affected by the encoding condition, the survival advantage was not obtained. Of note, the ARC scores of this group (low ARC) still suggest the use of the categorical structure of the list in their recall. Overall, in Experiment 1 the survival advantage was not observed. This finding does not correspond to our initial hypothesis and it is also not in line with the existing literature that has reported enhanced recall performance in studies where survival processing was used (Nairne & Pandeirada, 2008a; Nairne et al., 2007). The absence of the survival effect could be due to the fact that the items were presented along with their respective category labels, which could have especially encouraged the usage of the categorical organisation of the list (a relational type of processing) during the final recall task. Evidence for this type of processing in both conditions was obtained from the ARC scores that indicated participants did organise their recall according to the category structure provided at encoding. This increase in the level of relational processing afforded by the categorical structure of the list could have attenuated the survival advantage by not leaving “space” for other forms of processing to occur, such as item-specific processing. Burns et al. (2013) have suggested that “there is something unique about the survival scenario that typically fosters item-specific processing relative to other scenarios” (p. 8); if the dominance of the category organisation lessened the extent to which item-processing could occur in the survival condition, then we would expect not to obtain a survival advantage. Additionally, this form of relational processing could have been even further strengthened by the initial learning instruction for participants to memorise the words by trying to relate them to their respective categories. Another factor that could have minimised the survival advantage in our study was a higher congruency between the items and the scenario in the moving condition, as compared to the survival condition. Indeed, participants rated the items as more relevant to the moving condition than to survival increasing the likelihood that an increased number of items were recalled after moving processing due to congruity (Butler et al., 2009; Nairne & Pandeirada, 2011). Experiment 2 was conducted as a post-hoc experiment in an attempt to examine why the elimination of the retrieval practice task and the replacement of the cued-recall with a free recall test were insufficient to obtain the survival effect. Providing an organisational structure to the material may have been extremely salient to participants during the learning phase minimising the potential effect of the survival encoding task that seems to benefit mostly from a form of item-specific processing (Burns et al., 2011; 2013). This experiment was a replication of Experiment 1, with the exception that the items were not presented along with their respective category labels in an effort to prevent this form of relational processing prior to the scenario-rating task. We expected that by presenting the item on its own, more ‘cognitive space’ would be available for the scenario processing to influence subsequent recall, and thus, that we would observe the survival effect. Additionally, the initial learning instruction simply told participants to learn the information for a later memory task. This experiment also allows a further test of the procedural aspects in Marinho’s (2012) study that could have prevented the survival effect from occurring: providing the categorical structure of the information at encoding. Participants and apparatus. Fifty-three participants from the University of Aveiro (31 women), aged from 18 to 37 (M = 20.26; SD = 4.76) participated voluntarily. They were tested individually under the same conditions as in Experiment 1. Procedure and design. As in Experiment 1 participants were randomly divided into two groups: survival (N = 27) and moving (N = 26), and had to pass through three different tasks: an encoding task, a distractor task, and a memory task. The procedure of these tasks was a close replication of the one used in Experiment 1 with the following exceptions: 1) During the encoding task participants were simply instructed to memorise the words and no mention was made to any specific strategy they should use to memorise it, or to the possibility of categorically organising the information; and, 2) No category labels were presented along with the words during the initial learning period. The rest of the procedure remained as described in Experiment 1. We calculated the same dependent variables as in Experiment 1 and the hypotheses were the same: we expected not to observe differences between the conditions for the rating and response times, and expected to find a recall advantage for survival as compared to moving. Descriptive data for each condition are presented in Table 3. Ratings. Replicating the results from Experiment 1, the words received significantly higher rating scores in the moving scenario than in the survival scenario t(51) = 7.41, p < .001, for the subject analysis; and t(35) = 4.11, p < .001, for the item analysis (see Table 3 for descriptive information). A correlation analysis between rating and recall for each condition revealed a positive correlation for the moving to a foreign land condition (r = 0.31, p = .12), although this was not significant. On the other hand, there was a negative correlation between rating and recall of items in the survival condition (r = -.05, p = .82), but this relationship was non-significant. Although none of the correlations were significant, it is worth noting that the size of the correlation was almost seven times higher in moving than in survival, suggesting that participants in the moving condition tended to remember more words with higher ratings, in agreement with a congruity argument. Response times. The distribution of the response times (Table 3) shows that participants in the survival condition rated the words slightly faster than those in the moving condition, but this difference did not reach significance (t(51) = 0.10, p = .92, for the subject analysis; t(35) = 0.19, p = .85, for the item analysis). Overall recall scores. Similar to Experiment 1, there was no significant recall advantage for the words rated under the survival scenario, t(51) = -.54, p = .60, for the subject analysis; and, t(35) = 1.04, p = .30, for the item analysis. Cumulative-recall curves. As there was one participant who did not follow the instruction to note the minute information during recall, the total number of participants in the moving condition was reduced to 25 in the final analysis. The cumulative-recall curves are plotted in Figure 2. Mean cumulative-recall for each condition in Experiment 2. The mixed ANOVA, with the cumulative recall per minute (1st, 2nd, 3rd, 4th, and 5th) as a within-subject variable and group (survival or moving) as a between-subjects variable, revealed that there was a significant effect of time, F(1.61, 80.40) = 175.33, p < 001, ηp2 = .78. However, neither the effect of condition (moving vs. survival), F(1, 50) = .01, p = .94, ηp2 < .001, nor the interaction between items recalled per minute and condition, F(1.61, 80.40) = 1.71, p = .15, ηp2 = .03, were significant. 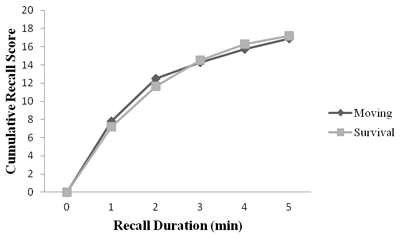 Further pairwise comparisons of recalled items per minute showed that during the first two minutes the participants recalled significantly more items in both groups (p < .001) when compared to the last three minutes. The increase in recall was also significant between the second and the third minute but only in the survival condition (p = .001, for survival; p = .31, for moving). During the last two minutes, on average, very few additional items were recalled (2.7 in the survival condition and 1.9 in the moving condition), but this difference was not significant (lowest p = .15). The univariate ANOVA verified that the rate of approaching asymptote (Table 3) was significantly higher in the moving to a foreign land condition than in survival, F(1, 50) = 5.34, p = .03, ηp2 = .10, suggesting more relational processing was present in the moving condition than in survival. Inversely, the asymptotic level of recall achieved higher estimate values in the survival condition than in moving; however this difference did not reach statistical significance, F(1, 50) = 1.16, p = .29, ηp2 = .02. Clustering scores. Although in this experiment we did not provide the category labels, it is still possible that participants noticed some organisation among the items and used it as a cue to organise their recall. For this reason, we calculated the ARC scores considering the same categorical structure of the information as in Experiment 1. The obtained mean ARC scores are presented in Table 3 and reveal that the two groups still produced a moderate degree of clustering, suggesting that both groups used the categorical structure of the material to some extent to organise their recall. However, the t-test for independent samples failed to verify a reliable difference between conditions, t(50) = -1.46, p = .15. As in Experiment 1, a median-split was performed according to the participant’s ARC scores. Participants were grouped according to either high ARC scores (N = 12, for moving; N = 14, for survival) or a sub-group with low ARC scores (N = 13, for moving; N = 13, for survival). The corresponding data are shown in Table 2. The additional analyses on the low ARC scorers, using a non-parametric Mann-Whitney test, revealed a significantly higher level of clustering for survival (M = .28) than for moving (M = .18); U = 44.5, z = -2.05, p = .04. In terms of their recall performances, no significant difference was found between conditions, t(24) = 0.07, p = .94. Experiment 2 closely replicated the main findings of Experiment 1. Most importantly, survival processing revealed a higher recall level in comparison to moving processing, although this difference was not significant. Moreover, the cumulative recall analyses confirmed that both survival and moving processing produced nearly identical cumulative-recall curves, although more relational processing seems to have occurred in the moving condition as suggested by a higher rate to approach asymptote. A highly reliable rating advantage was again found in this experiment for the moving condition compared with the survival condition, which could have constrained the observation of a survival advantage due to congruity. In order to compare performance of participants in Experiment 1 (category label presented) and Experiment 2 (category label not presented), and to determine whether performance was influenced by the presentation of the category labels as predicted, the total recall and level of relational processing afforded by the categorical structure of the information (clustering) were analysed with a univariate ANOVA. The presentation of the category label (presented – Experiment 1; and not presented – Experiment 2) and the scenario condition (moving versus survival) were included as between-subjects variables. Regarding total recall, there was no significant main effect of experiment F(1, 111) = 1.57, p = .21, ηp2 = .01, condition F(1, 111) = 0.18, p = .67, ηp2 = .002, nor an interaction F(1, 111) = 0.16, p = .69, ηp2 = .001. These results suggest that the presence of the category label was not a determining factor for the absence of the typically observed survival effect. We predicted that the absence of the category labels in Experiment 2 would reduce the amount of relational processing and thus, the reliance on the category organisation in the final recall. An univariate ANOVA analysis of the ARC scores obtained in the two experiments and conditions revealed a significant main effect of experiment F(1, 110) = 13.72, p < .001, ηp2 = .11, with higher ARC scores observed in Experiment 1 where the category labels were presented. However, there was no significant effect of scenario, conditions, nor interaction between experiment and condition, F(1, 110) = 0.01, p = .95, ηp2 < .001; and, F(1, 110) = 0.20, p = .66, ηp2 = .002, respectively. This result suggests that the presence of the category labels in the initial learning period (Experiment 1) did, in fact, lead the participants to rely more on this form of relational processing to recall the information, as compared to when these were absent (Experiment 2), as predicted. However, this manipulation did not affect recall performance as we expected. The survival processing effect is characterised by improved memory performance after the information is processed in terms of a survival scenario, as compared to a control condition (e.g. Nairne & Pandeirada 2008a; Nairne et al., 2007). The experiment reported by Marinho (2012), in which a RIF procedure was used failed to replicate this phenomenon. The RIF procedure differs from the typical survival paradigm in a number of ways. The aim of the current set of experiments was to try to determine whether the procedural changes introduced in this adapted paradigm may explain Marinho’s failure to replicate the survival effect. To this end, in Experiment 1 the retrieval-practice phase from Marinho’s procedure was eliminated and the cued recall task was replaced with a free recall task. In the second experiment, we removed the categorical structure of the to-be-learned information by eliminating the category label previously presented with each item and the instruction to relate the items to the respective category labels. It was expected that changes that made the procedure more similar to the usual survival paradigm would increase the likelihood of observing the survival effect. An additional aim of these experiments was to contribute to the debate on one of the proposed potential mechanisms underlying this effect: the item-specific vs. relational processing account (Burns et al., 2011; Burns et al., 2013); the usage of ad hoc categories (as per Marinho, 2012) allowed us to do so. In none of the current experiments we were able to replicate the survival mnemonic advantage. The possible reasons behind this failure to replicate will now be considered. As just mentioned, in the two experiments the procedure used by Marinho (2012) was adapted to be more in line with the usual survival paradigm in order to understand the factors that prevented the survival effect from occurring in her second experiment. In the first experiment of the current study, the encoding task still differed from the typical survival paradigm, as it provided specific information about the category structure, making this information highly salient to participants. Additionally, this experiment used intentional learning instructions that specifically asked participants to learn the words by relating them to its respective category, and 6 sec were allowed for this learning to occur. A confirmation that this information was relevant to the recall output was obtained by the ARC scores, which revealed that a considerable amount of clustering occurred to a similar degree in both the survival and moving conditions. The salience attributed to the category structure during learning might have minimised the attention given to the scenario rating task that followed for each word. Consequently, survival or moving processing might not have influenced memory performance. In addition, if the survival advantage is driven mainly by an increase of item-specific processing, as suggested by Burns and collaborators (Burns et al., 2011; Burns et al., 2013), relying so heavily on the category structure of the list may have eliminated the need for this type of processing to retrieve the information. In order to minimise the reliance on the category structure in the second experiment, the ad hoc category labels were omitted during the encoding task. The absolute ARC scores revealed participants relied less on the category structure of the list as intended. A direct comparison of the ARC scores obtained in the two experiments, confirmed that the removal of the category labels successfully reduced this type of processing. In spite of this experimental manipulation, the survival advantage was still not obtained in Experiment 2. Another procedural aspect maintained from Marinho’s (2012) study, and that differs from the typical survival work, is the nature of the learning task – intentional learning. The typical survival paradigm, akin to the levels-of-processing procedure (Craik & Tulving, 1975) uses incidental learning procedures. These are characterised by the fact that participants encode or learn the to-be-remembered information without being aware of the up-coming memory test. Incidental learning tasks allows one to better control the type of processing the information receives during encoding, thus enabling a more pure measure of its impact in memory performance. In both of our experiments (again, replicating a portion of Marinho’s work), an intentional learning procedure was used. Participants were instructed at the outset of the experiment to memorise the information. Furthermore, they were given 6 sec to learn the word and only after this period of time, were they allowed to perform the rating task. By implementing an intentional memory procedure the participant can use whatever strategy he/she wants in order to memorise the information; thus, the experimenter looses control of the type of processing occurring at encoding. This form of procedure likely constrained the influence of the scenario rating task in the memorisation of the items and left room for idiosyncratic mnemonic strategies to take place. Again, this detail might have constrained the importance of the scenario encoding task in memory performance. One other factor worth noting is the time distribution during the encoding task. In Marinho’s (2012) studies, more time (6 sec) was given to memorise each word, whereas only 4 sec were given to the rate its relevancy to survival or to the moving to a foreign land scenario, a feature we kept in our studies. In the typical survival paradigm, participants are allowed 5 sec to rate each word, which provides them additional time to relate the word to the scenario. Besides providing extra time for participants to encode the word in ways other than relating them to the scenario, less time was given for them to think of the word with respect to the scenario. Future studies could investigate whether the time available to rate the words influences the survival effect. These procedural elements warrant further investigation. For example, research could explore whether the lack of the survival advantage was due to the intentional learning phase by eliminating it from the encoding procedure. In this procedure, the survival advantage may be obtained as has been reported elsewhere. In a couple of experiments, Burns et al. (2013) compared a survival encoding task with a moving encoding task also using ad hoc categories and replicated the survival mnemonic advantage using, not only free recall as the memory test, but also recognition, in both within and between-subject designs. Thus, it seems unlikely that the nature of our list, in itself, was responsible for the failure to replicate the survival advantage. One last element that may underlie the obtained data is the difference in relevance-ratings observed between the two conditions. Specifically, in both experiments, participants rated the items as more relevant to the moving scenario than to the survival scenario. According to a congruency account, items considered more relevant should be easier to remember than the ones considered less relevant (Butler et al., 2009; Nairne & Pandeirada, 2011). The correlation values between recall and rating obtained in each experiment revealed that such a trend exists, but more strongly in the moving condition, reinforcing this hypothesis. In order to further explore this idea, future research should be carried out using other stimuli that could be considered similarly relevant to both of the encoding scenarios. Survival processing is perhaps the greatest “encoding procedure yet identified in human memory research” (Nairne et al., 2008a, p. 380) as it consistently leads to better performance than a wide list of control conditions (Nairne, 2010; Nairne & Pandeirada, 2010). However, by employing a RIF procedure, Marinho (2012) failed to find such an effect as also observed in the current experiments. The procedures employed by Marinho (2012) and in the current experiments introduced substantial procedural changes to the typical survival procedure, and it is believed that these could explain the failure to replicate. Providing the category structure of the to-be-learned information, allowing a specific period of time to intentionally learn the information, or a possible confounding due to a higher congruency between the items and the control condition, are among some of the issues that warrant further research on this interesting phenomenon. Note: This list corresponds to a translation into English of the items presented in European Portuguese in our studies. Marinho, P. I. O. (2012). O Impacto do processamento de sobrevivência no PIER. [The impact of survival processing on the Retrieval-Induced Forgetting Paradigm]. Master’s thesis. Portugal: University of Aveiro. Retrieved from http://hdl.handle.net/10773/10232. Pandeirada, J. N. S., Pires, L. and Soares, S. C. (). Revisiting the survival mnemonic effect in children. Evolutionary Psychology, in press. Schneider, W., Eschman, A. and Zuccolotto, A. (2002). E-prime user’s guide. Pittsburgh: Psychology Software Tools Inc..